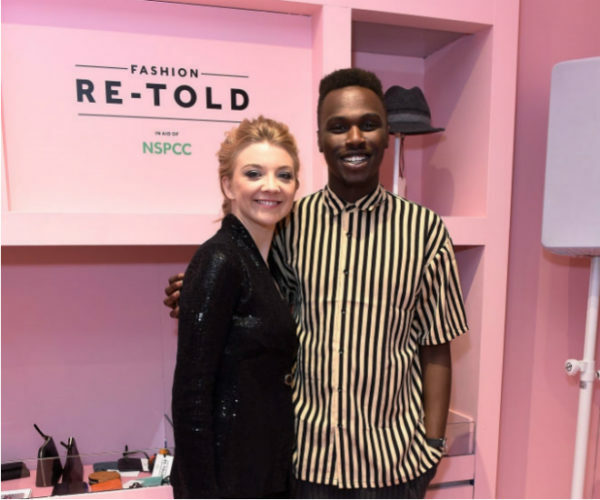 Harrods’ recent initiative alongside NSPCC, Fashion Re-Told, aims to reduce wastes and speak to its Millennial target consumers in ways that are important to them. 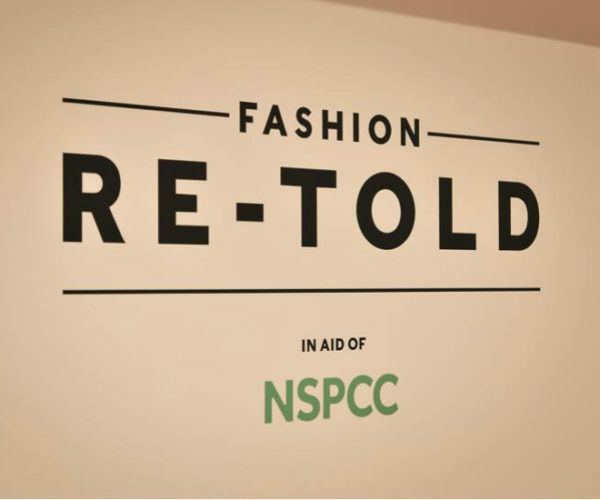 The pop-up boutique, Fashion Re-told, was officially launched on the 12 April and opened to public the next day, Friday. 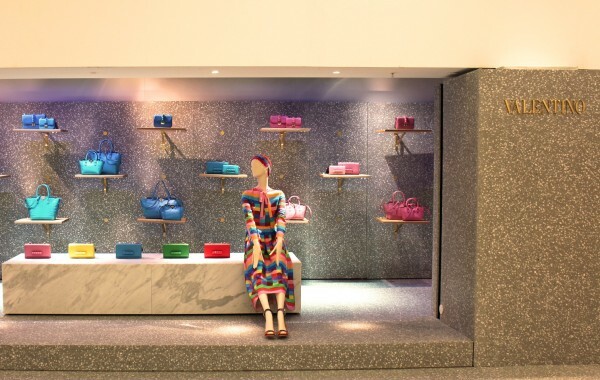 Located on Sloane Street in London on premises are donated by Cadogan Estates, the pop up is nested amongst luxury labels such as Tom Ford, Gucci and Louis Vuitton. Running on for one month, it will be will be the luxury department store’s first standalone charity store as well as one of the most upscale charity shops in our century. 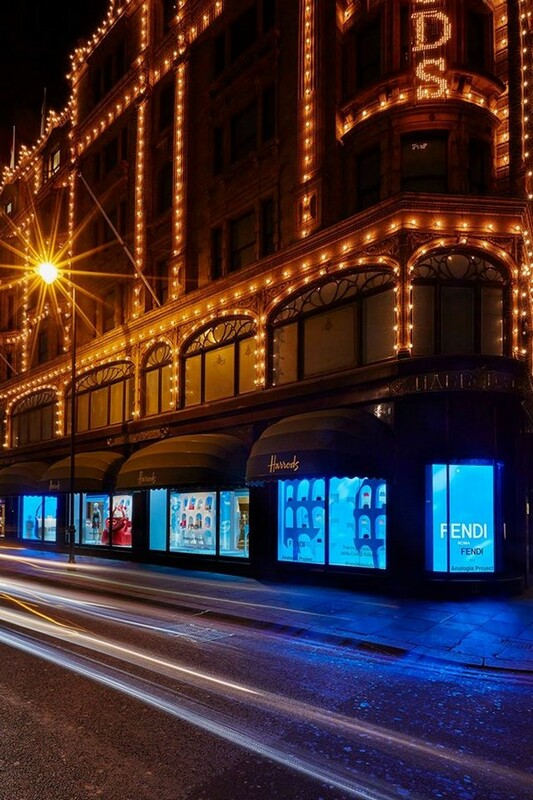 Customers can peruse and shop a selection of designer and high-end pieces, which have been donated by Harrods customers, employees as well as luxury brands themselves. Notable labels are Paul Smith, Mulberry and Peter Pilotto, with pieces from womenswear, menswear, kidswear, to accessories. In the same spirit as Harrods’ usual highbrow edit, the charity store aims to offer a changing, eclectic selection, including signature brand items such as the popular Loewe elephant coin purse. 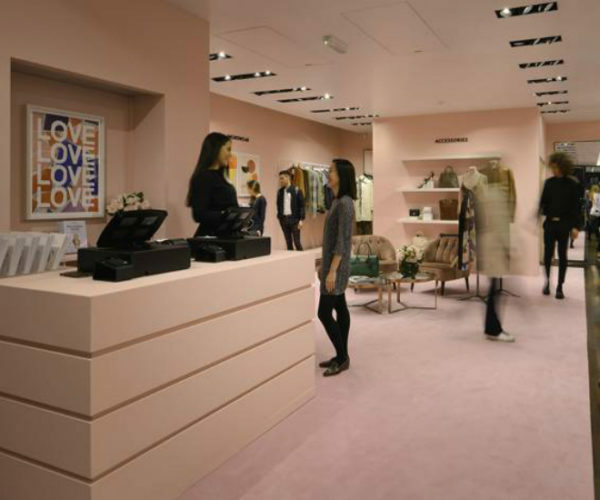 The interior of the boutique is a dreamy candy-floss pink, a corporate colour of NSPCC. Alex Greco Wells, head of visual merchandising at Harrods, explains the colour theme as a “lighthearted approach to make people smile”. 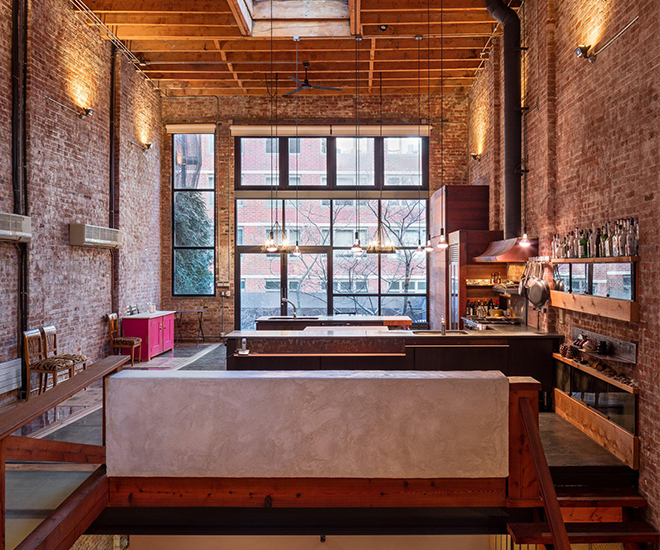 “We just want to create something fun, a visual interpretation of an appropriate aesthetic for the collaboration, without the ostentatious and overpowering feel of a luxury store,” Wells added. Besides purchasing, customers are also encouraged to bring in donation pieces from their own collections. In fact, one of the highlights in the initiative is an Alaïa dress donated by Helen David herself, the chief merchant of Harrods. Staff members involves both Harrods and NSPCC volunteers. 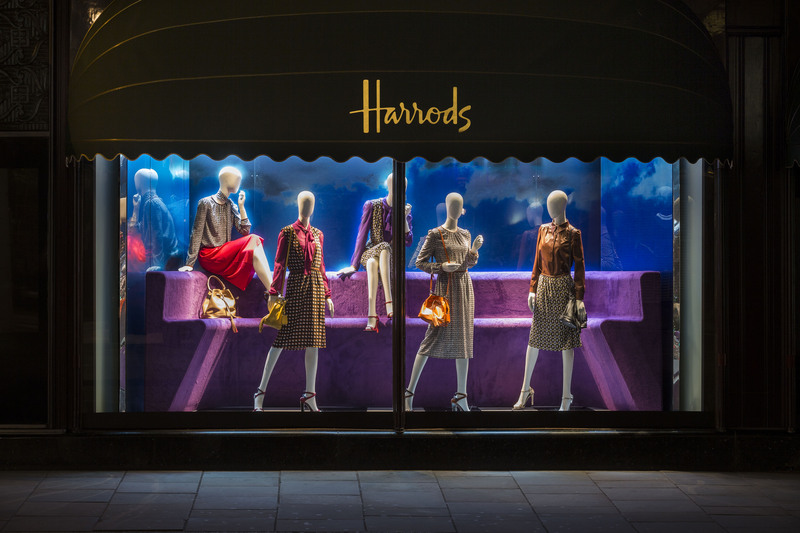 Michael Ward, Harrods’ MD, states that the initiative can recur if it’s a success. 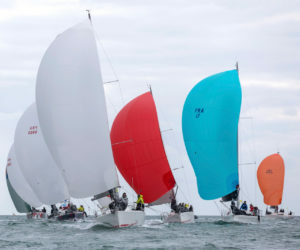 Prices range from £100 to £200. All proceeds will go to NSPCC, on a mission to end child abuse in the U.K. and Channel Islands. This entry was posted in Fashion, Lifestyle and tagged charity, Fashion, Harrods, NSPCC on April 16, 2018 by Shirley Wang. Among watch lovers, there’s a certain affection for “Hulk” diving watches, that is to say, diver watches with green dials and green bezels. “Hulkmania” as we have come to know it in watch collecting circles is a phenomena that can be traced back to Baselworld 2010 when Rolex released a submariner with a never before seen, completely unexpected bright green colour scheme for one of the brand’s most beloved and popular models. Introduced as a replacement for the Submariner’s 50th anniversary – a model which featured the signature black dial framed with a green bezel. 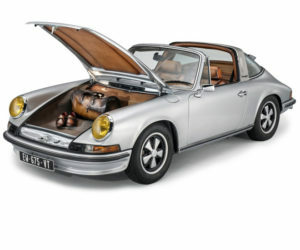 Thus, the new 2010 variant was a total surprise and a little controversial. Yet, despite of its controversy, the “Hulk” became a defining, sought after timepiece for owners looking to standout from your typical black elements on steel Submariner wearing crowd. In fact, it can be argued that the Tudor Black Bay’s appeal was precisely because it was diving watch cloaked in the familiarity of nostalgic design elements courtesy but with long forgotten colour schemes and aesthetics. 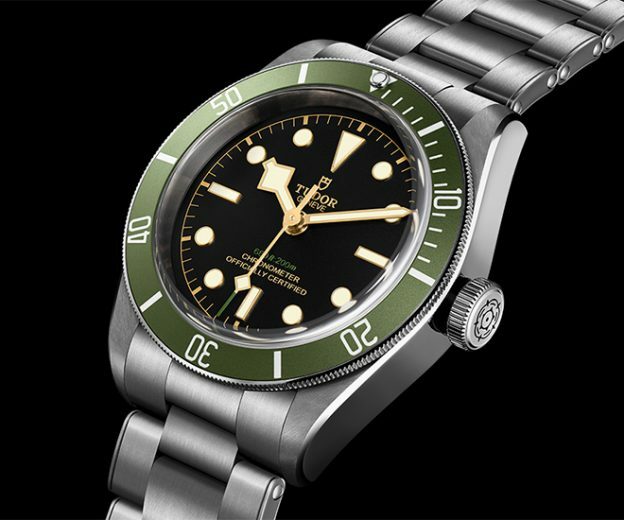 The Tudor Black Bay is itself, one of the key defining watches for the brand. Introduced two years after the aforementioned Hulk Submariner which single handedly ignited appetites for green themed timepieces, The Tudor Heritage Black Bay took its place as a seminal timepiece which also stole the limelight from some of its venerable older siblings. What might have begun as a corporate experiment in watchmaking using Rolex Oyster cases but not its calibres and retailed for less was a history that Tudor sought to shake for the better part of its business history and it is our contention that the Tudor Heritage Black Bay was the final impetus which made it possible. Yes, it is true that “Heritage” is a prefix associated with the Black Bay but the Heritage Black Bay, while respectful of the brand’s history, is anything but a heritage re-issue. Instead, like the Hulk, it courts controversy (much in the same way their new brand ambassador, Lady Gaga does). 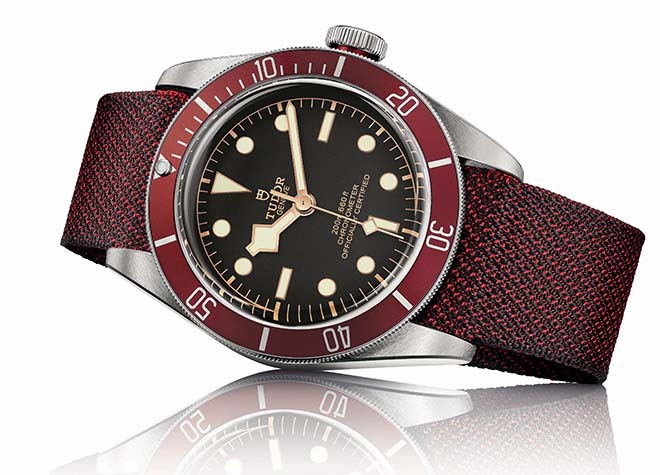 When it was first launched, the Tudor Heritage Black Bay was perceived by purists to be a mish-mash of historical references: a gilt, rose dial, big crown, snowflake hands, etc – it was the sort of thing which while curiously attractive, was generating a lot of discomfort to a segment of watch collectors. That said, President of Tudor, Philippe Peverilli emphasised that the Heritage Black Bay was not a remake but rather an inspired divers watch with heritage elements. Like the Hulk Submariner which launched before it, the Tudor Heritage Black Bay bore the look of a classic Submariner, but with modern day sensibilities. 5 years on, the Tudor Black Bay Green for Harrods is a special edition which takes Hulkmania and “Hulksmashes” it into another genre re-defining timepiece – sure, there’s no green dial but make no mistake, the Harrods green is a focal design element used judiciously across the bezel, the tip of the seconds hand and in fine subversion of another point of Rolexmania, the “single red” line of text – waterproof depth rating is now in green as well. 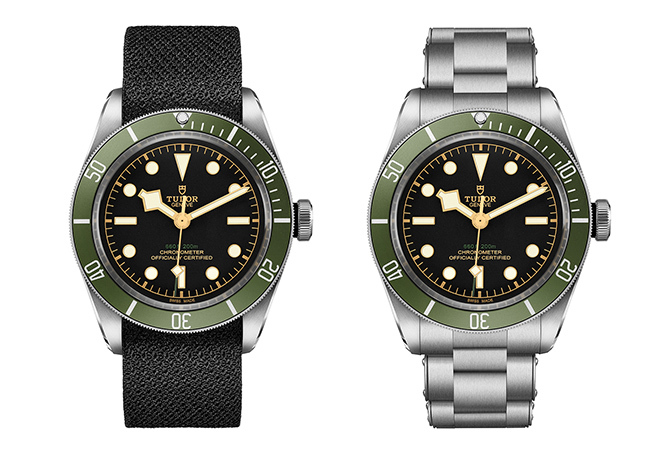 All elements which serve to play up the Harrods Special Edition Tudor Black Bay Green. 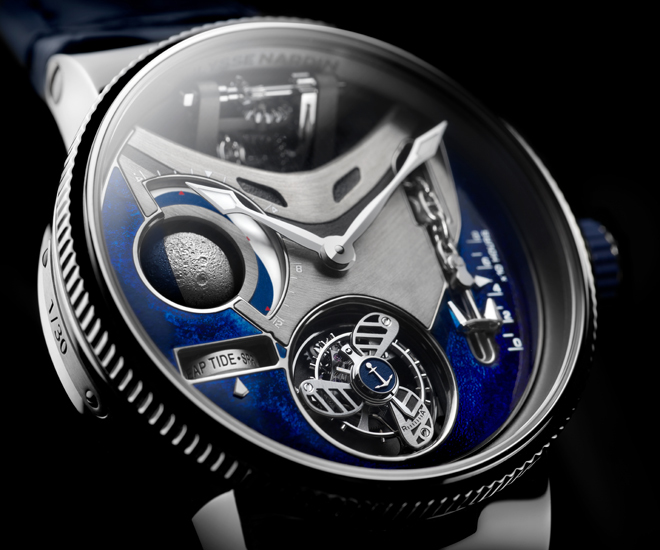 Tudor makes special emphasis to play up the collaboration with the famed Knightsbridge institution by calling attention to the detail that the waterproof depth rating is presented with imperial feet measurements preceding metric metres rather than the metric measurements first, that we have come to associate with Tudor diving watches but it is also worthwhile to note that Rolex Submariners already do so and perhaps we are reading into this, but inversion of this element on the Tudor Heritage Black Bay Green draws the relationship a little closer (perhaps unintentionally), it would be exciting to see what Tudor releases for Baselworld 2018. 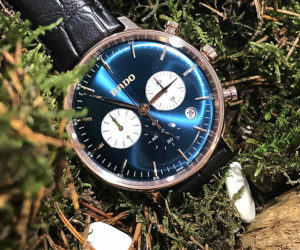 This entry was posted in Editor's Picks, Homepage Slider, World of Watches (WOW) and tagged dive watches, Harrods, Heritage Black Bay, Tudor on December 19, 2017 by Jonathan Ho. It is never too early to think about Christmas, especially if you have something special up your sleeve, as department store Harrods and fashion label Burberry demonstrated. 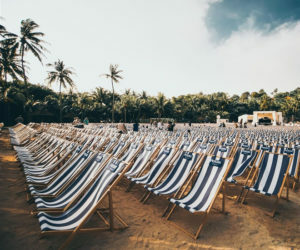 The British brands have joined hands to launch a set of holiday initiatives and an exclusive capsule collection. The activities, branded under the banner “A Very British Fairy Tale,” are due to kick off in November and will include a holiday-themed winter window installment at the Harrods Brompton store, which follows two children on an imaginative journey through the English countryside. 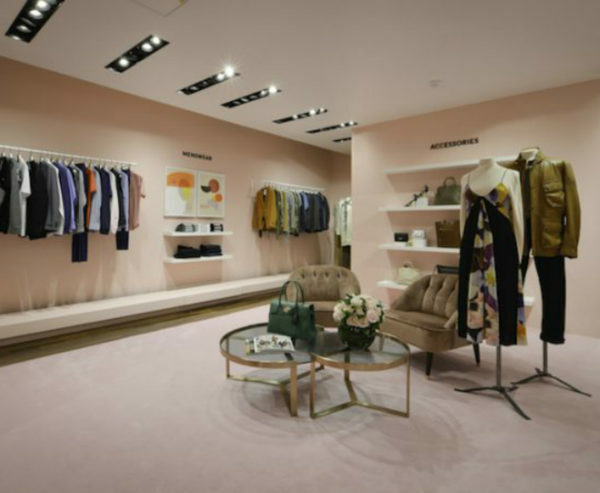 Additionally, the store will also stock an exclusive capsule collection by Burberry comprising ready-to-wear, accessories and gifts. 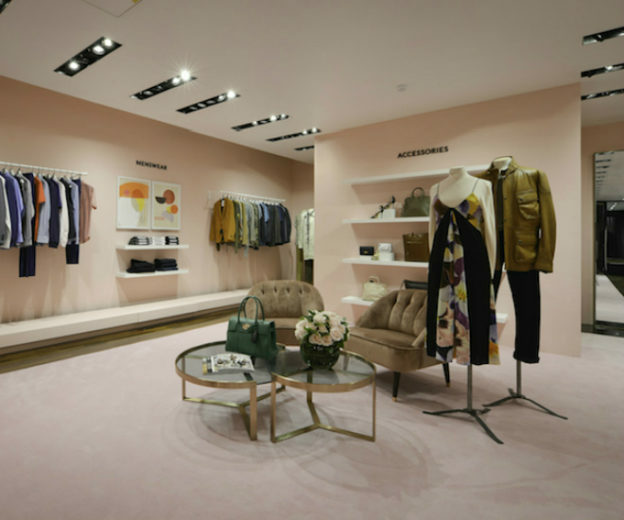 The brand will also mount craftsmanship and personalization stations at the store, which will allow shoppers to have their Burberry purchases monogrammed by an artisan. The tie-up is part of a wider major new strategic plan by Burberry, which aims to further fine-tune its merchandise offer and strengthen existing relationships with wholesale partners WWD reported. This entry was posted in Fashion and tagged burberry, capsule collection, christmas, Harrods, partnership, window display on July 23, 2016 by AFPRelaxnews. Joining forces with crystal maker Baccarat, cognac house Remy Martin presents the world with a unique blend of brandy, the Louis XIII Le Mathusalem. 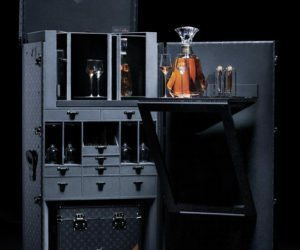 The six-liter cognac, which is brandy from the Cognac region in France, is presented in a crystal carafe by Baccarat that is known as a Mathusalem. Crafting the specially designed carafe is no easy feat, considering that it takes more than 20 master craftspeople from Baccarat to create it. An old metal flask dug up from a battlefield in 1850 inspired the design and shape of the decanter, while the brand retained Remy Martin’s iconic Fleur-de-lis medallions. Each of the decanters are mouth-blown and numbered while the neck of the bottle is adorned with 24k gold. The cognac in each crystal carafe has been produced by blending 1,200 eaux de vie that are aged in Remy Martin’s cellars. 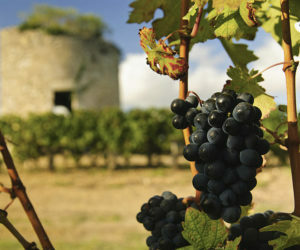 While some of the cognacs sit in oak barrels for at least 40 years, a select few are even aged for a hundred years. The eaux de vie are made using wine grapes from the Grande Champagne area in the Cognac region; this is the most obvious distinction separating Louis XIII from other cognacs because it is 100% Grande Champagne. Each limited edition decanter will be accompanied by a pipette that was designed exclusively for the Louis XIII Le Mathusalem. The pipettes are used by the cellar masters to extract and taste each eaux de vie from the barrels. Fans of the cognac can expect the first release to be launched sometime between September to October. 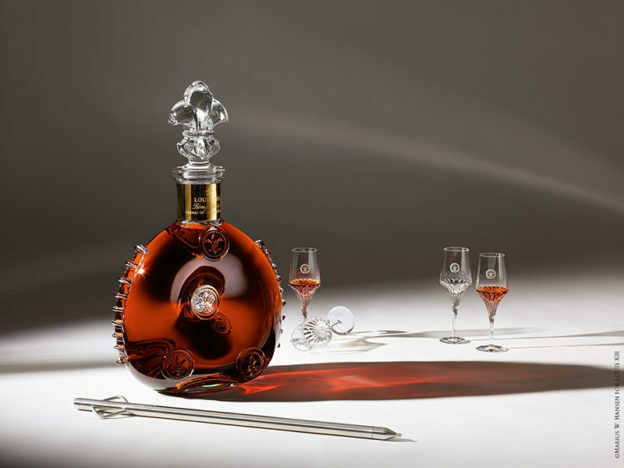 Come November, the Louis XIII Le Mathusalem will be available at Harrods, the London department store. 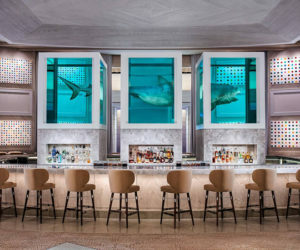 This entry was posted in Uncategorised, Wines and Spirits and tagged Baccarat, Cognac, Harrods, Louis XIII Le Mathusalem, Remy martin on July 11, 2016 by Vimi Haridasan. 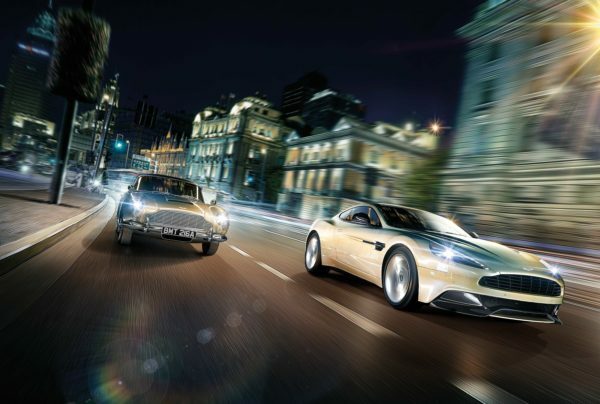 When we heard about this tribute to Aston Martin at Harrod’s, we had to cover it. 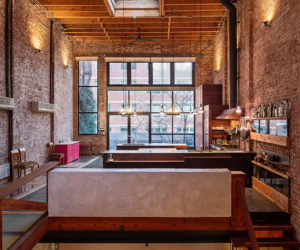 Our readers have shown a persistent affection for the brand (this is one of our all-time most-popular stories) and what they love, they get more of. 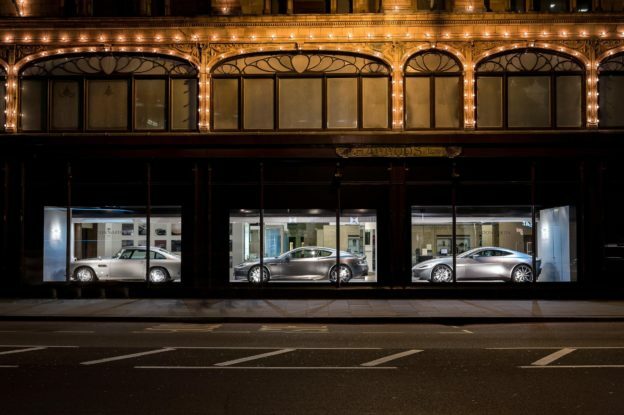 Basically, the AFP is reporting that three Aston Martin cars will take over the Harrods storefront window in London as part of a month-long celebration of the British-made automobile. Aston Martins have been synonymous with James Bond films for the last 50 years. The DB10 being shown at Harrods was built specifically for the latest Bond film Spectre. Also on display is the new Austin Martin model DB9 GT (below). Arguably the most famous of Aston Martins, the DB5, can be seen at the luxury department store in the Knightsbridge area, as well. This model was released in 1963 and set a standard for Aston Martins to follow with its improvement in performance. As an aside, we published a photo essay pitting the DB5 against the Vanquish right here. Ok, back to the story on hand. 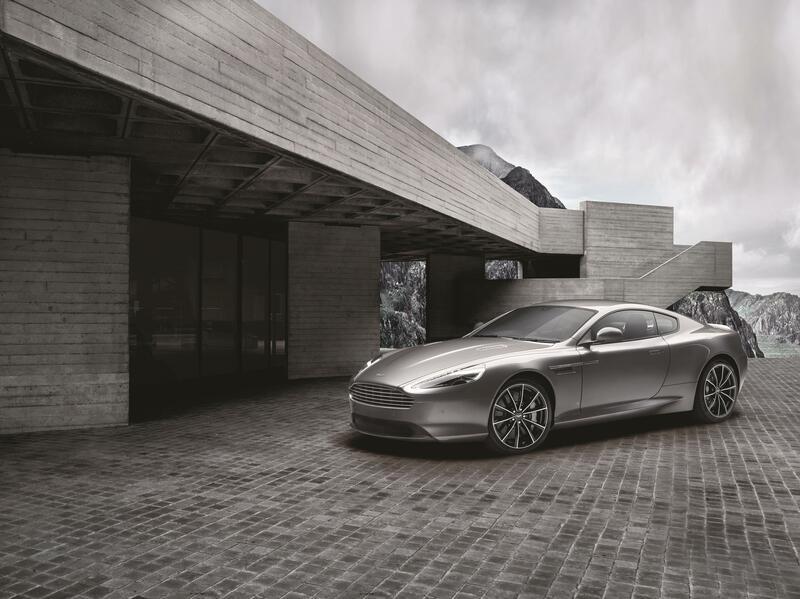 Aston Martin specialists will be at Harrod’s throughout an accompanying exhibition to provide visitors with insight into the cars and their product range. 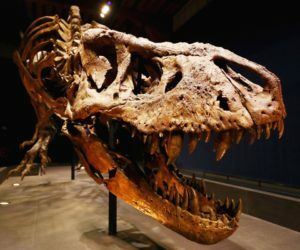 If we were able to make it to this exhibition, you know how we would be harassing… The window display and the exhibition will run until January 28. This entry was posted in Cars and Bikes and tagged aston martin, Aston Martin DB10, aston martin db5, aston martin DB9, exhibition, Harrods, London on January 9, 2016 by Staff Writer. 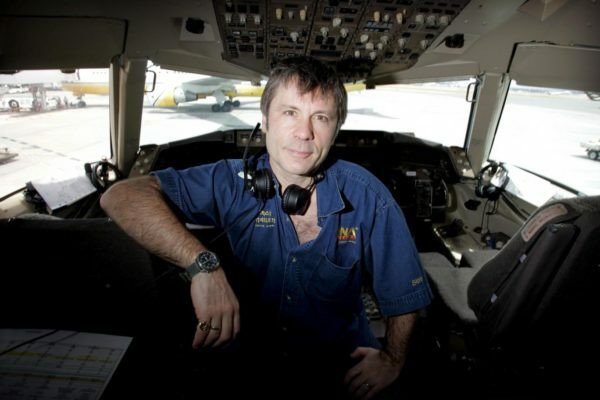 Iron Maiden singer Bruce Dickinson has joined forces with famed London retailer HARRODS to open a pop-up shop for private jets. Dickinson is chairman of Aeris Aviation, an aircraft dealership from which the pop-up will be funded upon opening later this month. The pop-up will sell special-edition Harrods jets and is reported to be looking towards the least expensive end of the market with Eclipse 550 jets by One Aviation that retail for £2.2 million (approximately $3.4 million). 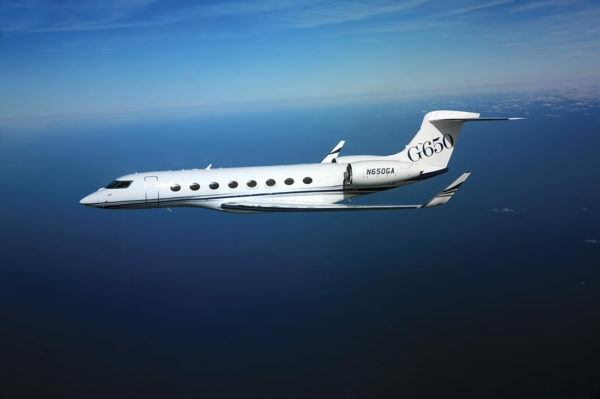 At their priciest, private jets such as a Gulfstream G650 can cost up to £41 million (approximately $64 million). This entry was posted in Jets and tagged Harrods, pop-up store, private jet on August 21, 2015 by AFPRelaxnews. Fendi is honoring its new Roman headquarters with an Italian-themed London pop-up store this August. 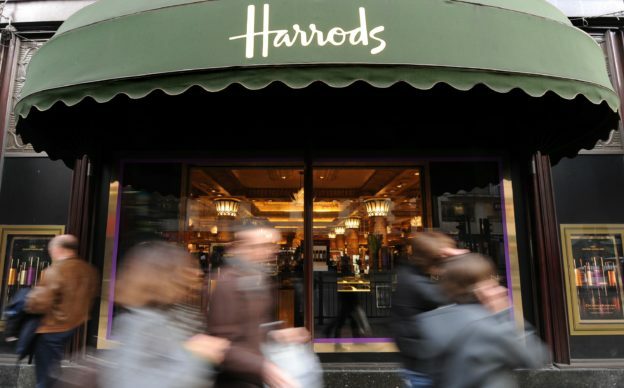 The luxury fashion house is setting up shop in the UK capital’s upmarket department store Harrod’s, Women’s Wear Daily (WWD) reports. 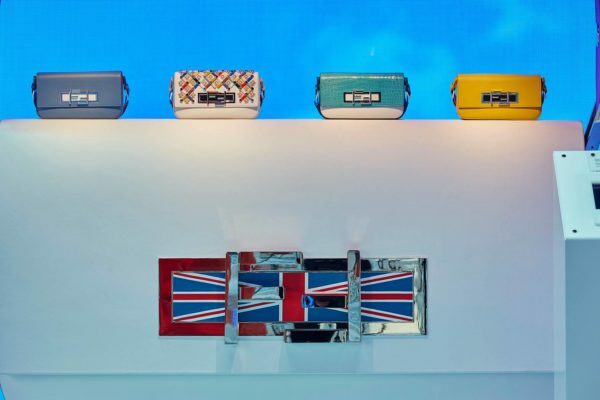 The brand will be giving shoppers the chance to design a 3Baguette bag, with Silvia Venturini Fendi herself judging the entries, and the winner receiving a unique bag designed by Venturini Fendi for Harrods. Special edition accessories will also be for sale in the space. Fendi recently opened up its new headquarters in Rome’s Palazzo della Civiltà Italiana. The 1930s-style building will be recreated in Harrod’s by Andrea Mancuso and Emilia Serra from the design studio Analogia Project. 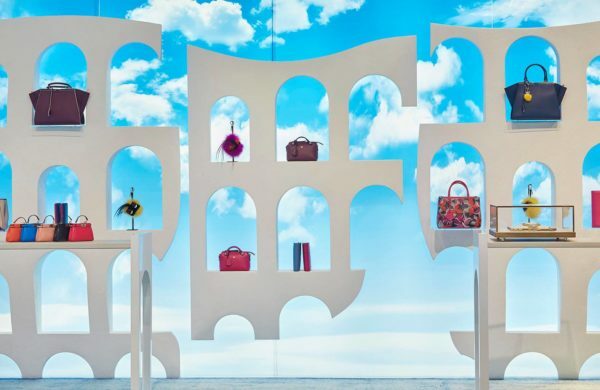 “We wanted to tell the story of the Palazzo Della Civiltà Italiana and this new chapter in the history of Fendi,” CEO Pietro Beccari told WWD. 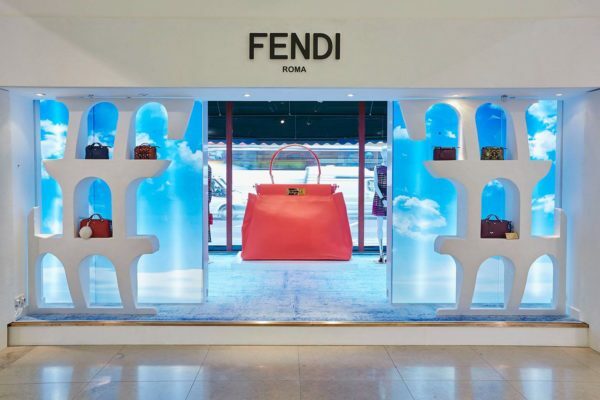 The Fendi pop-up at Harrods will run August 6-30. 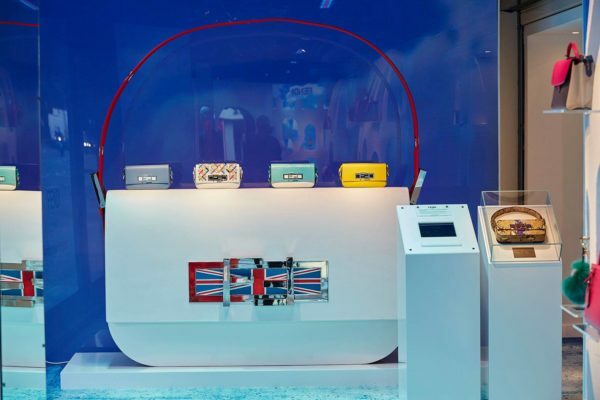 This entry was posted in Accessories and tagged Fendi, Harrods, pop-up store on August 11, 2015 by AFPRelaxnews. 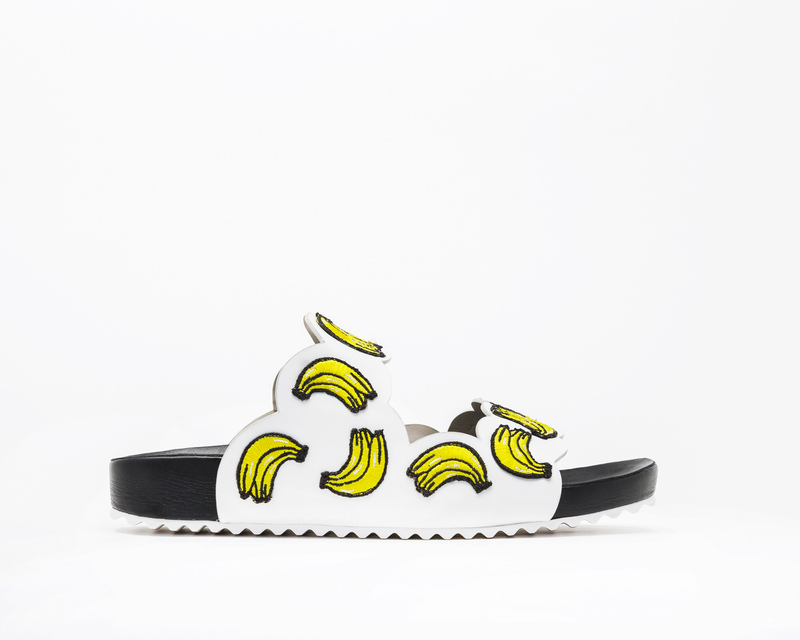 Sophia Webster will showcase her fun range of fruity shoes in her very own pop-up store at London’s top luxury retail destination. As of Monday, shoppers at Harrods will be able to discover quirky slide sandals, ‘flatforms’, wedges and show-stopping heels from Sophia Webster’s latest footwear collection. Taking inspiration from the fruit references running through her Spring/Summer 15 collection and her East End heritage, the pop-up brings ‘London’s most luxurious fruit stall’ to Harrods. The exclusive pop-up will remain open for one month and will house the largest selection of Sophia Webster styles in the UK. Price tags for the collection range from £250.00 ($385) for slide-ons to £495.00 ($765) for the more elaborate flamingo vinyl print heels. 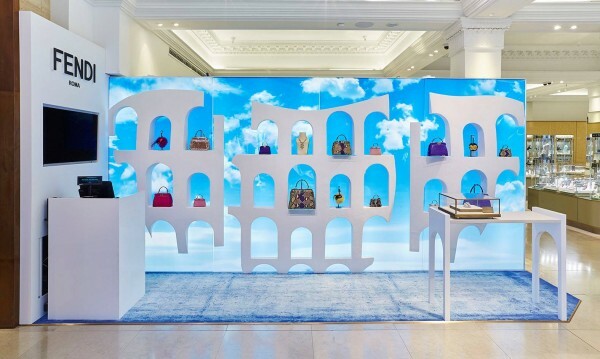 This entry was posted in Events, Fashion and tagged department store, Harrods, luxury shoes, pop-up store, shoes on February 17, 2015 by AFPRelaxnews. Luxury London department store HARRODS has created a special pop-up store to celebrate an exclusive capsule collection created by Valentino. VALENTINO creative directors Maria Grazia Chiuri and Pierpaolo Piccioli have designed a collection of women’s accessories and ready-to-wear just for Harrod’s, which will be available until January 2015 in the dedicated pop-up space designed by renowned architect David Chipperfield. 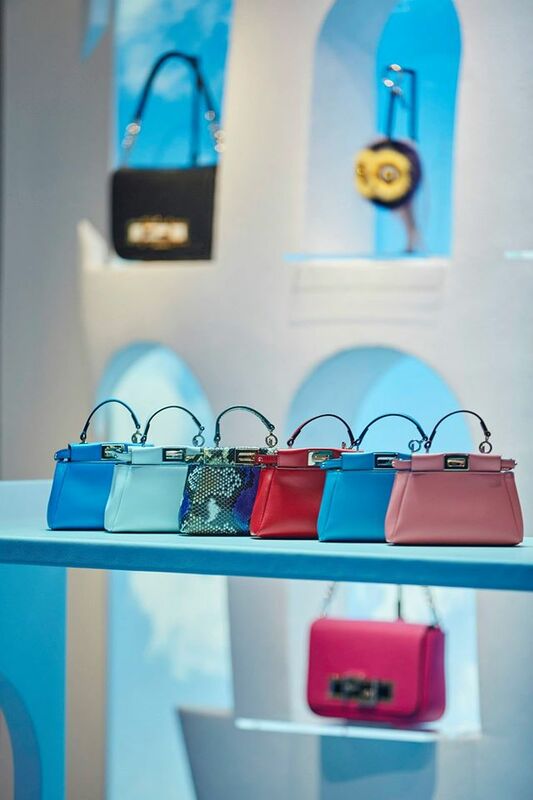 Leather bags and accessories come in a choice of multicolored options which come with a bold pattern and lacquered studs and single color versions in solid shades with classic ton-sur-ton studs. The ready-to-wear includes four embroidered dresses, three gowns and a short dress. 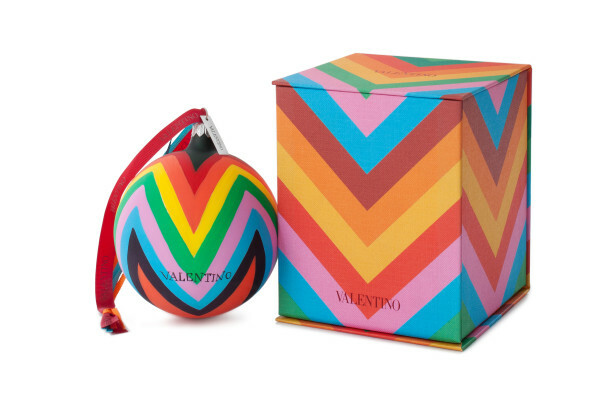 In addition you can also dress up your tree this year with specially hand-blown Valentino glass baubles in a range of colors and patterns. 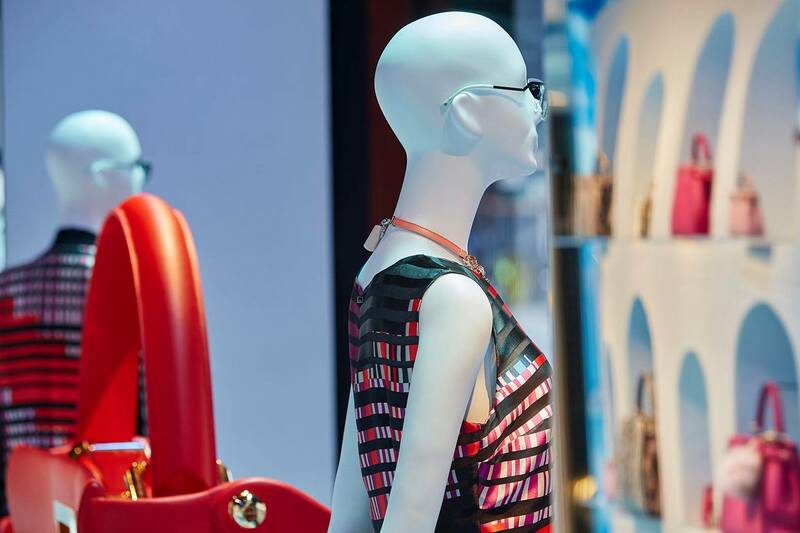 Three of the department store’s Brompton Road windows have been given over to the special capsule, with a fourth holiday window showcasing a Peace concept with a reinterpretation of a 1991 white haute couture gown. This entry was posted in Events, Fashion and tagged capsule collection, Harrods, pop-up store, Valentino on December 1, 2014 by AFPRelaxnews. 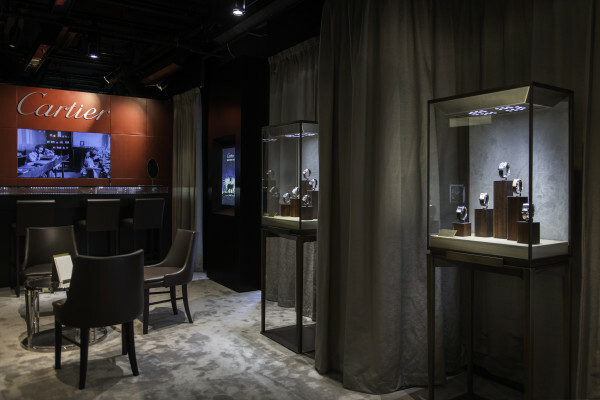 Cartier has opened its first pop-up space at Harrods dedicated to men’s watches and accessories. 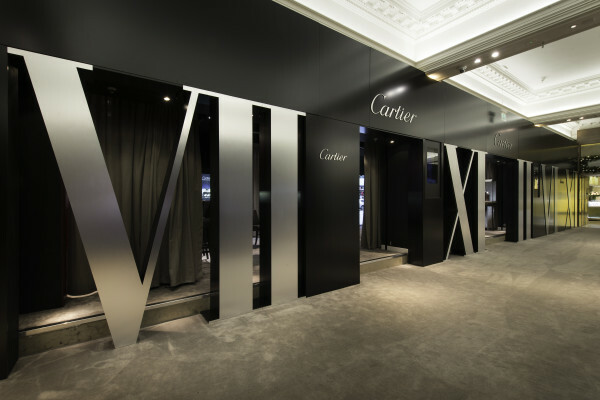 ‘The Man by Cartier’ will run until November 19. The exhibition features a range of pieces from the house’s archives, mixing vintage models and new watches, leather goods and accessories. 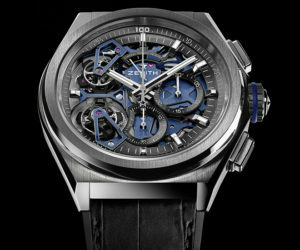 Key exhibits include classic models (The Santos, The Tank, and the Ballon Bleu) alongside the new Calibre de Cartier Diver. 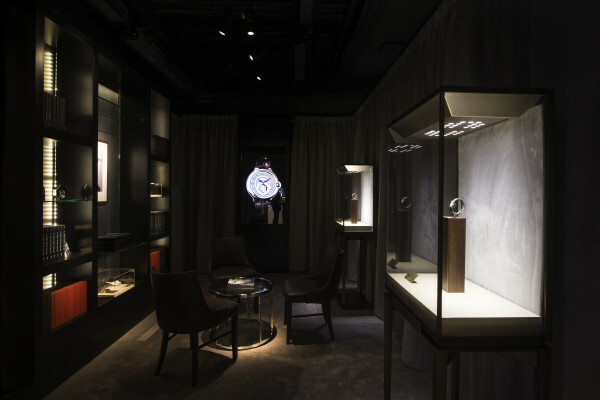 “HARRODS and CARTIER are both committed to providing clients with the ultimate luxury experience, which makes this exhibition not only an ideal partnership, but also an exciting opportunity for our customers to view rare Cartier pieces,” explained Helen David, Harrods Director of Womenswear, Accessories, Fine Jewellery, and Childrenswear. 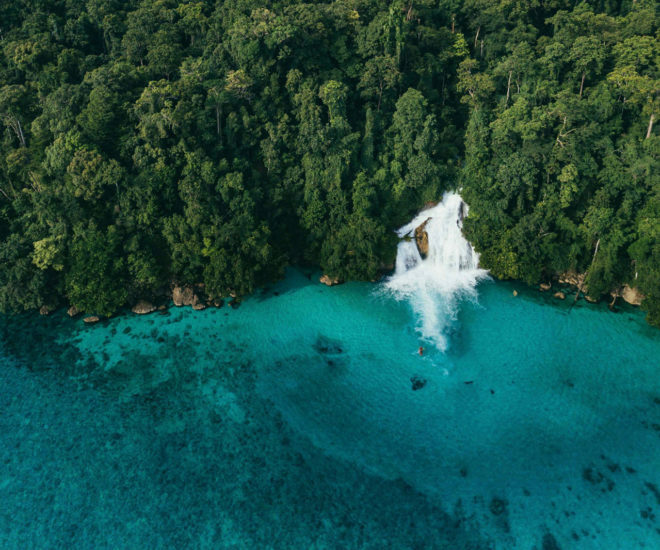 “110 years after the creation of the first modern wristwatch by Louis Cartier, we pay homage and celebrate the man’s natural home in the Cartier universe,” added Laurent Feniou, Managing Director of Cartier UK. The French brand has also taken over four of the store’s Brompton Road windows for the duration of the project. Harrods has had a busy year when it comes to brand events and goings-on, having hosted the month-long Pradasphere exhibition in May, and also featuring interactive Ermenegildo Zegna window displays earlier this month. 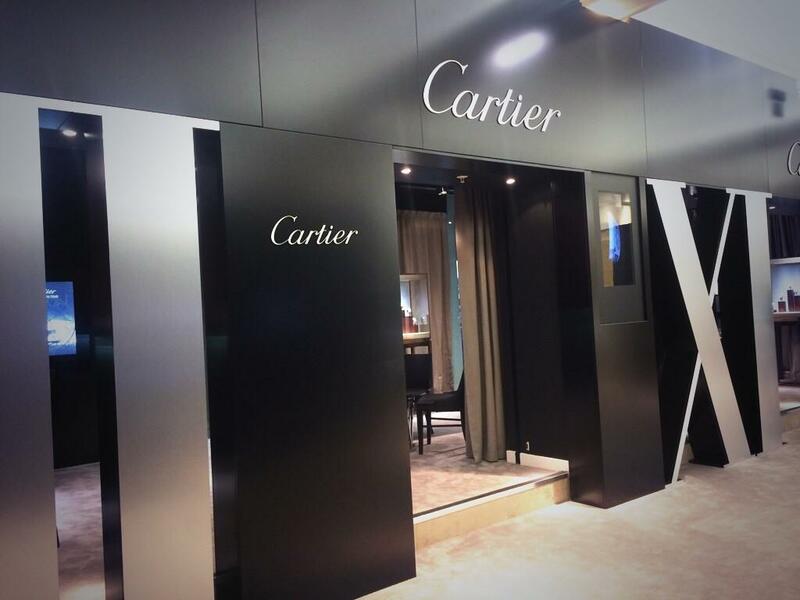 This entry was posted in World of Watches (WOW) and tagged cartier, Harrods, pop-up store on November 14, 2014 by AFPRelaxnews. 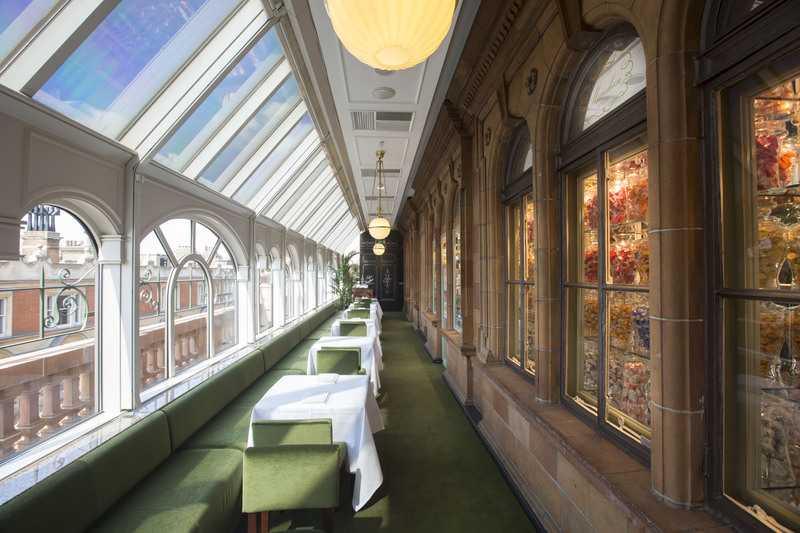 HARRODS has teamed up with the British Fashion Council to go behind the scenes in the ateliers of four of the city’s biggest designers. 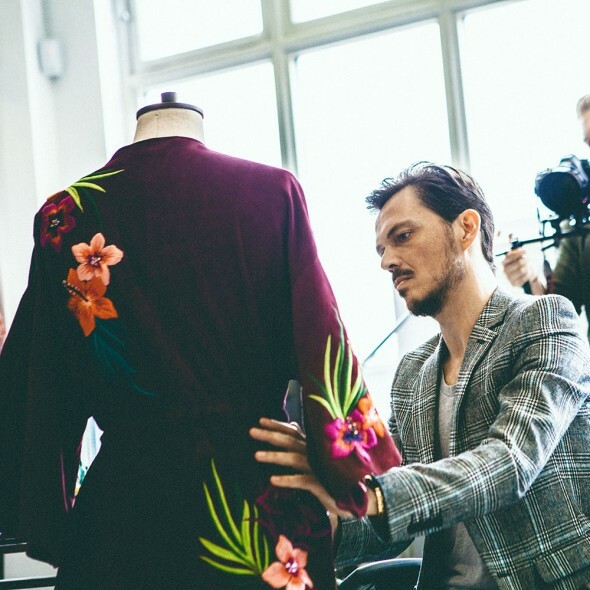 London-based fashion designer Matthew Williamson, along with fellow UK-based designers Rupert Sanderson, Antonio Berardi and Alice Temperley, have worked with Harrods on a series of online films. In the first video, released this week, Williamson and his artistic director Georgie MacIntyre talk about the creative process from the moodboard and first concepts to the final runway show for the completed collection. A further three films will arrive and will also explore the creative muse-designer relationships between Jade Parfitt and Rupert Sanderson (above)), Sophia Neophitou-Apostolou and Antonio Berardi (October 24), and Jacquetta Wheeler and Alice Temperley (October 28). 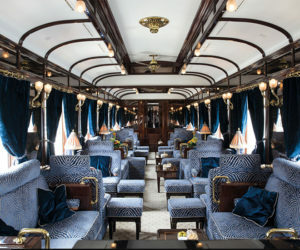 You can also visit harrods.com/inside-the-studio for exclusive content and the chance to shop the pieces featured in the films. This entry was posted in Fashion and tagged Harrods, short film on October 22, 2014 by AFPRelaxnews. 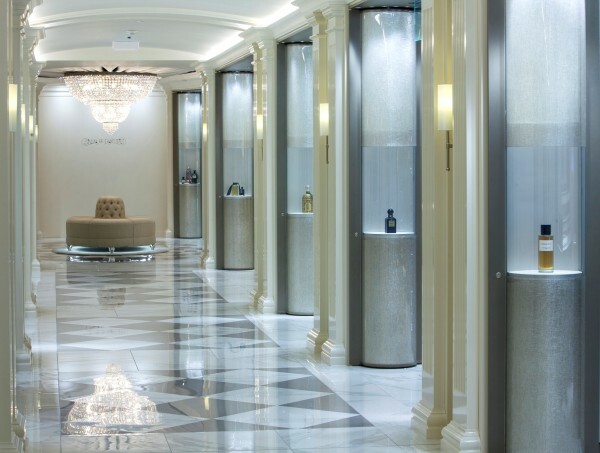 London department store HARRODS has opened a new fragrance haven featuring some bespoke treats for perfume fans. The Salon de Parfums opened this month on the store’s sixth floor and the space contains eleven brand boutiques showing off the ranges of some of the world’s finest fragrance labels: Kilian, Chanel, Clive Christian, Creed, Dior, Ex Nihilo, Guerlain, Henry Jacques, Roja Dove Haute Parfumerie, Tom Ford and Xerjoff. There’s a fragrance gallery including world exclusive brands like Thomas Kosmala, Liquides Imaginaires and Dead of Night, as well as further special perfumes from Dolce & Gabbana, Elie Saab and Bond No.9. 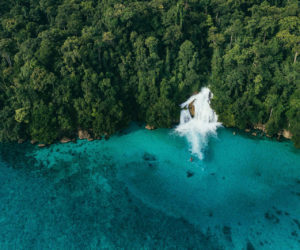 The boom in fine and niche fragrances (which this week saw Estée Lauder purchase Le Labo) drove the concept behind the space: “a growing appreciation for fine fragrance and a greater interest in individuality inspired us to develop a unique perfumery concept,” explained Mia Collins, head of beauty at Harrods. The Salon de Parfums is also the exclusive stockist of the ‘No1 Passant Guardant’ fragrance by perfumer Clive Christian; it retails at £143,000 (approx $230,000), making it the world’s most expensive scent. This entry was posted in Beauty and tagged department store, fragrance, Harrods, perfume on October 20, 2014 by AFPRelaxnews. The London department store is celebrating its new ‘Shoe Heaven’ floor with a capsule featuring exclusive designs from designers including Louboutin and Valentino. On the final night of London Fashion Week, Harrods hosted an exclusive party to celebrate the launch of its new Shoe Heaven and unveiled a capsule collection of heavenly ‘Silver Lining’ shoes. 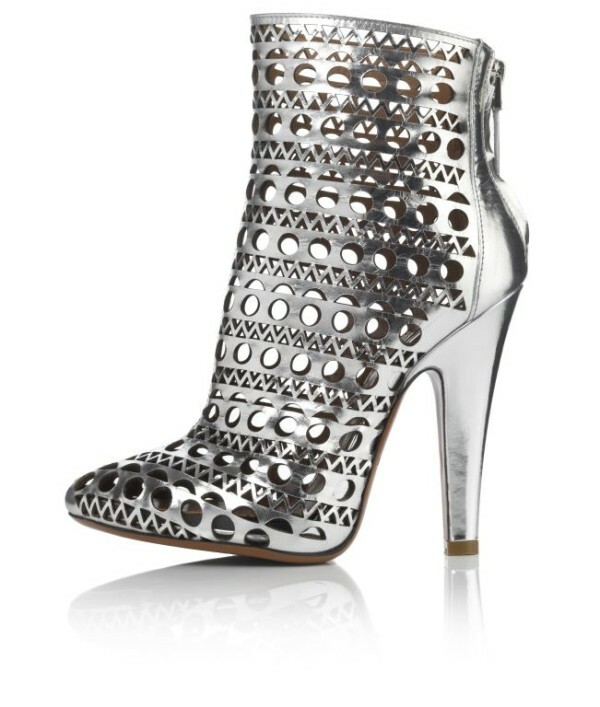 The limited-edition ‘Silver Lining’ collection showcases 37 of today’s most iconic shoes in bright metallic silver. The designers involved include Valentino, Charlotte Olympia and Christian Louboutin. Standout models include Alaïa’s laser-cut boots (£990), a Giuseppe Zanotti sneaker (£855), and a Valentino rockstud sandal (£1045). The DJ set came from Mark Ronson, and fellow celeb guests included actors Suki Waterhouse and Dominic Cooper, and model Edie Campbell. This entry was posted in Fashion and tagged Harrods, shoes, silver on September 18, 2014 by AFPRelaxnews. 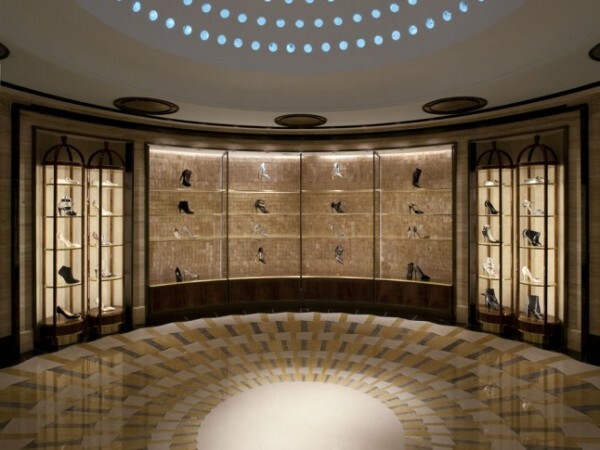 The London luxury department store has unveiled a brand new footwear department, named Shoe Heaven. The new area is located suitably high-up, on the fifth floor of the HARRODS store in London’s smart Knightsbridge district. 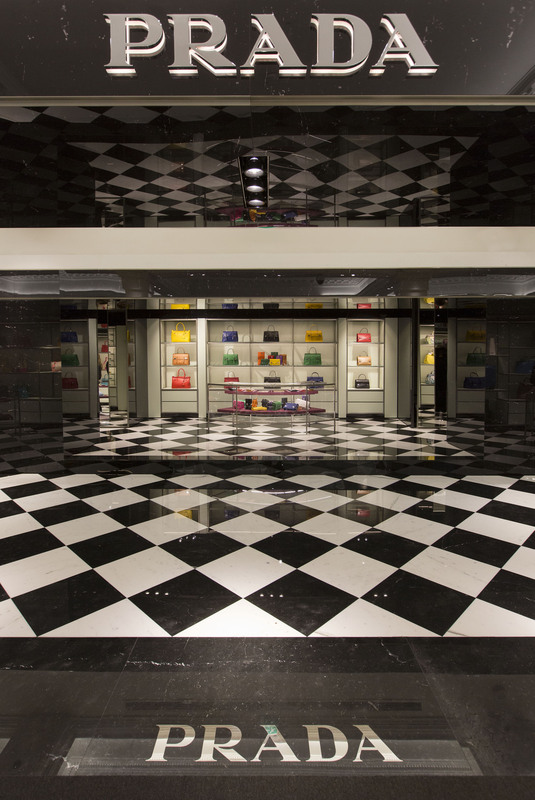 Pushing 42,000 sq ft, the space contains 17 footwear boutiques with collections from over 50 of the biggest luxury brands including Christian Dior, Chanel, Christian Louboutin, Valentino, Manolo Blahnik and Louis Vuitton. 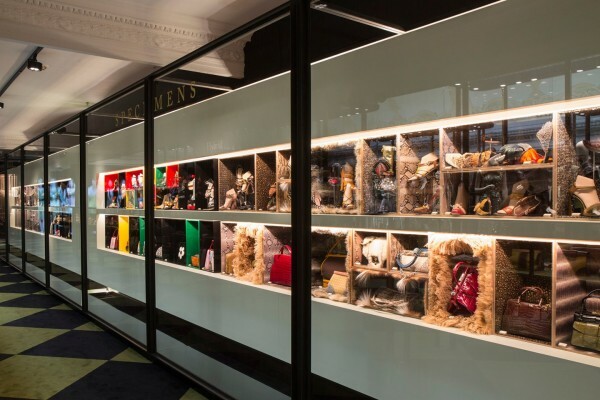 Shoes are “becoming an ever increasingly important part of the way a woman dresses, and indeed a key part of our business,” explained Helen Davids of Harrods; “the space will be more ‘Penthouse’ and less ‘Shoe Floor,'” she added, in what is one of the store’s biggest rennovations to date. 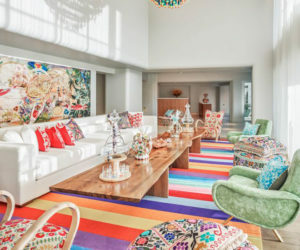 The luxe marble-floored space was designed by the late David Collins, the celebrated London interior designer who died last summer. This entry was posted in Fashion and tagged department store, Harrods, Luxury Footwear, luxury shoes, shoes on August 12, 2014 by AFPRelaxnews. During the month of May, Harrods Knightsbridge’s fourth floor will transform into Pradasphere, an exhibit dedicated to the iconic Italian label. 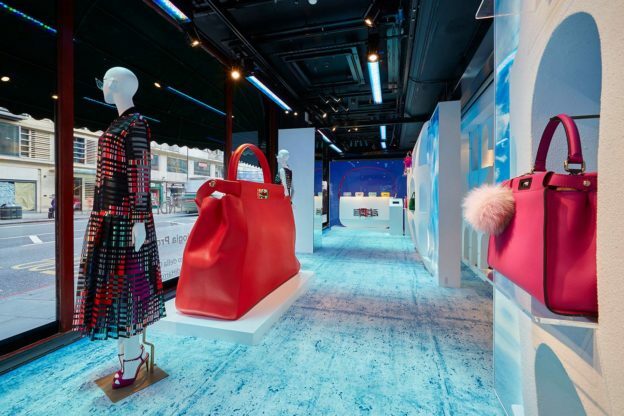 “Pradasphere will transport our customer into the fabulous world of Prada here at Harrods, marrying two brands synonymous with luxury, design and creativity,” Helen David, Harrods’ fashion director told British Vogue. 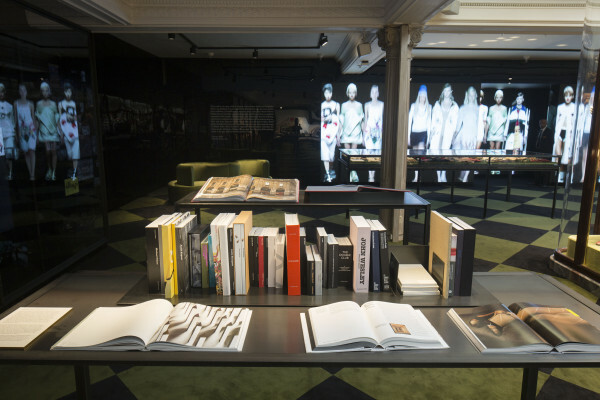 First up is in an exhibition hosted on the fourth floor, covering a selection of historic collections, collaborations and experiments from the famous label. Prada has also unveiled a capsule collection for the store, featuring a range of ready-to-wear pieces as well as bags, shoes and accessories. 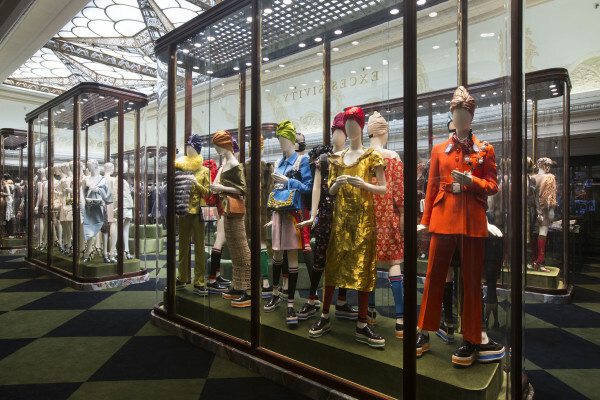 Creative director Miuccia Prada has apparently taken her creative inspiration from the brand’s extensive archives for the pieces. Throughout the month, will also get the chance to indulge in a few extra treats at the first-ever Pradasphere Café inside the store. The Pradasphere exhibition will run at Harrods from the 2 – 29 May. This entry was posted in Events and tagged department store, exhibition, Harrods, Prada on May 2, 2014 by Anakin. 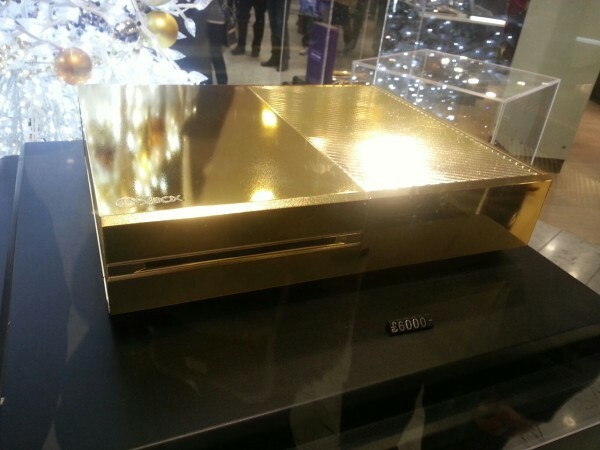 Retailing for £6,000 ($9,800) from London’s boutique department store Harrods is a 24-carat gold plated Xbox One. Reddit user SirSyhn posted the image after spotting Microsoft’s gold-encrusted console on a trip around the London store — one founded by a 19th century grocer and now owned by Qatar’s investment arm. This entry was posted in Tech, Uncategorised and tagged gold, Harrods on December 24, 2013 by Anakin. Hendrick’s Gin and fine jewellery designer Hannah Martin have created a luxury limited-edition hip flask that will be available exclusively at Harrods this Christmas. 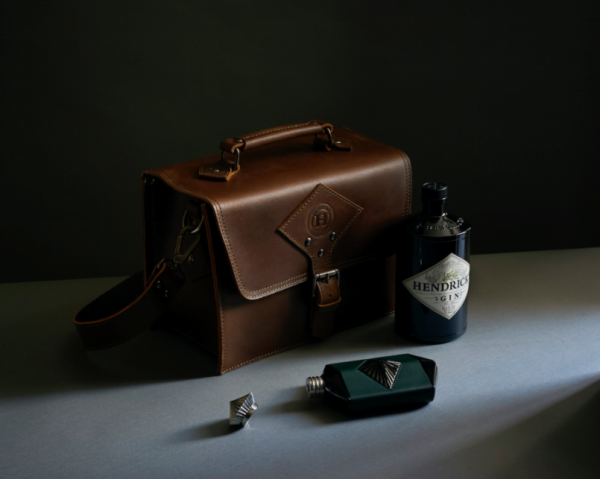 This luxurious item is presented in a handmade leather travelling bag with a bottle of Hendrick’s Gin and a bespoke silk and cashmere scarf from Scottish tailors Walker Slater. Combining the contemporary with the traditional, each limited edition glass vessel is individually hand-blown and diamond-embossed by artisans in Norfolk, and then encased in green leather. Before declining in popularity in the late 20th Century, hip flasks were a fashionable accoutrement of the upper classes, who used them to create, carry and share spirituous concoctions when they were out and about in town and country. Just 50 hip flasks and accoutrements (£795) are available to buy from Harrods from November. This entry was posted in Wines and Spirits and tagged gin, Harrods, jewellery, luxury flask on December 17, 2013 by Anakin. French visual artist Joanie Lemercier, Shawn ‘JAY Z’ Carter and Barneys’ Creative Director Dennis Freedman teamed up to create an interactive holiday installation this year in New York City. The light shows, 3D mapping and futuristic sleigh ride are all captured in this short film. 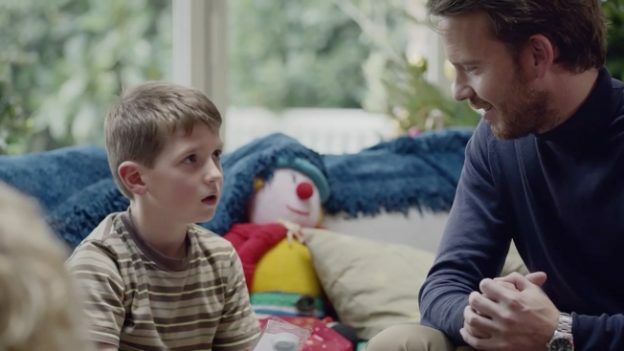 “A little something for them, a big something for you.” Luxury London department store Harvey Nichols carries on with its usual tongue-in-cheek Christmas campaign, which sees selfish relatives splurge on themselves instead of their loved ones. Bergdorf Goodman shows off this year’s ‘Holidays on Ice Windows’ in this reveal video, which features lit-up abseiling acrobats, and plenty of seasonal sparkle. A man is left waiting on the platform as his lady rushes to make the train: Harrods’ black and white silent movie comes with a message: don’t leave your shopping too late, Because Christmas Won’t Wait. There’s no message here, just lots of shiny gift ideas in this cool and colorful holiday video from Bloomingdales. 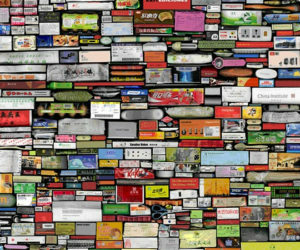 This entry was posted in Events and tagged ad campaign, christmas, department store, Harrods, Harvey Nichols, short film, video on December 15, 2013 by AFPRelaxnews. 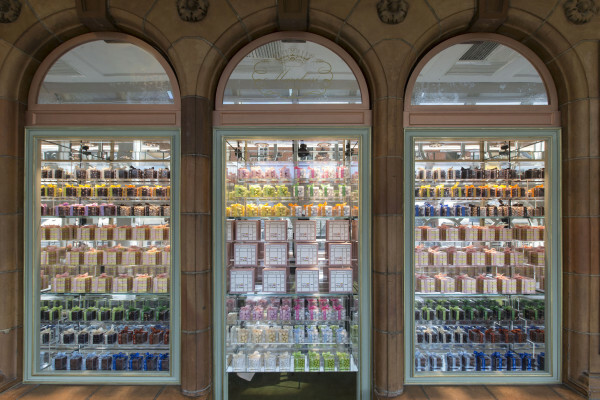 Starting on August 22 and running through September 19, Harrods‘ perfume hall will witness a series of fragrance masterclasses, in-store talks, and one-on-one perfume consultations with major luxury brands Chloé, Guerlain, and Annick Goutal all set to take part in the event. Chanel’s Joanna Norman (the guest fragrance professor for Chanel) will host an event on September 16 which explores the famed No. 5 and Coco perfumes with flavored champagne and macarons. 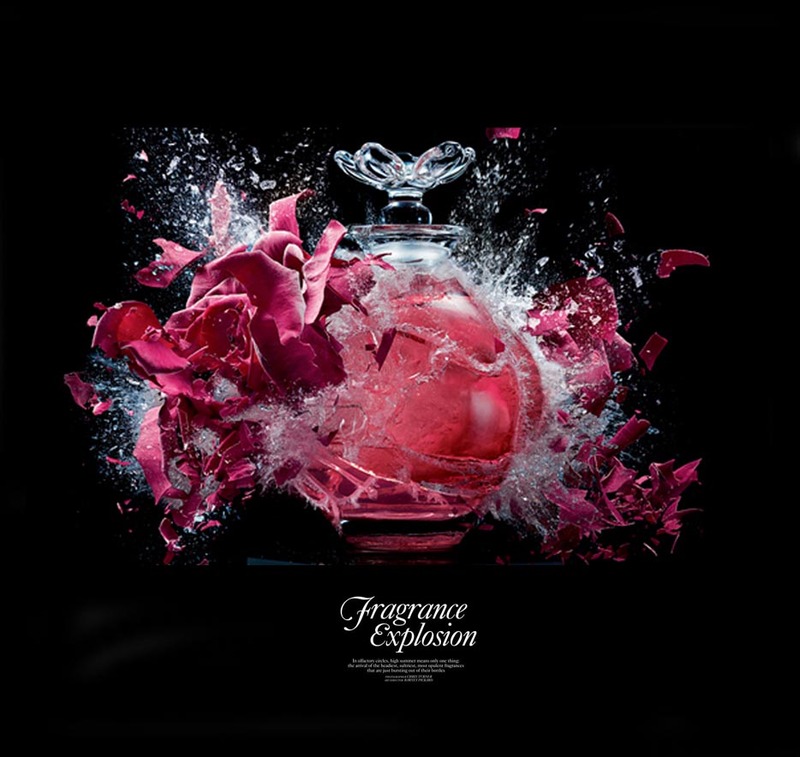 Harrods has also released an iPad app version of its in-store magazine, which allows users to access promotional videos and other additional content in advance of the “Fragrance Explosion” event. This entry was posted in Events and tagged fragrance, Harrods, perfume on August 19, 2013 by AFPRelaxnews. 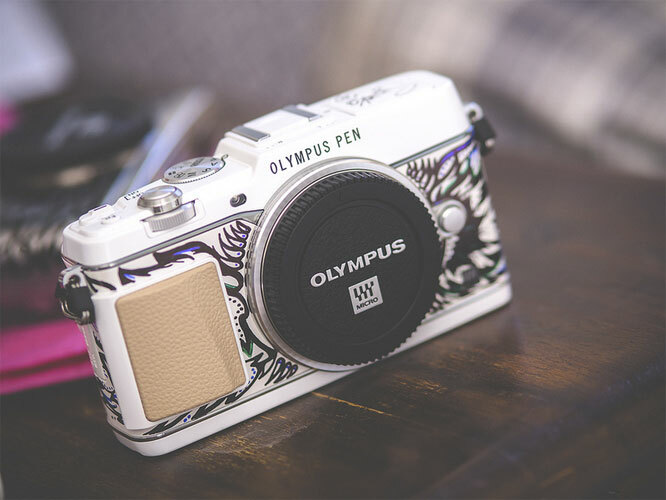 Olympus has teamed up with urban artist Susie ‘Suzko’ Lowe, fashion photographer Jay McLaughlin and Harrods to offer a strictly limited number of handpainted special edition cameras. 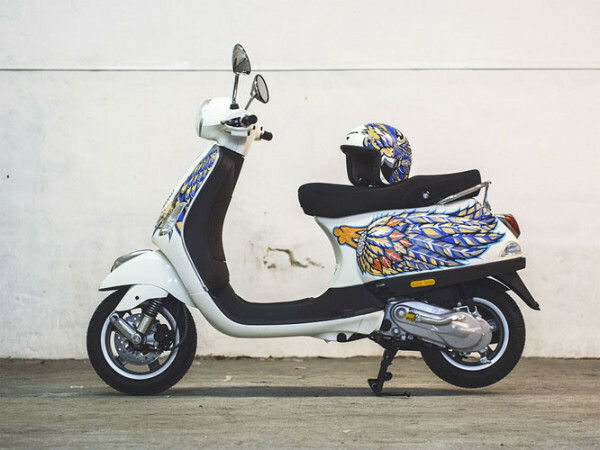 Available exclusively through Harrods in London, each ‘Art Edition’ camera has been individually hand-painted by Susie ‘Suzko’ Lowe, and has its matching Vespa Motor scooter and crash helmet. The final cherry on the cake is that it comes with a one-one-one photography lesson with renowned fashion and street photographer Jay McLaughlin who was brought in by Olympus to document the customization process (he has created a special perfect-bound catalogue detailing the transformation) and to help decide the camera’s specification and accessories. As well as a unique, hand-painted body, each camera also comes with a second, stock camera body for everyday use and one of each compatible Olympus-made lens currently available. Harrods and Olympus have not confirmed how many Art Editions will be created. The Art Edition goes on sale from Thursday, exclusively at Harrods for £16,000 (about US$25,000). 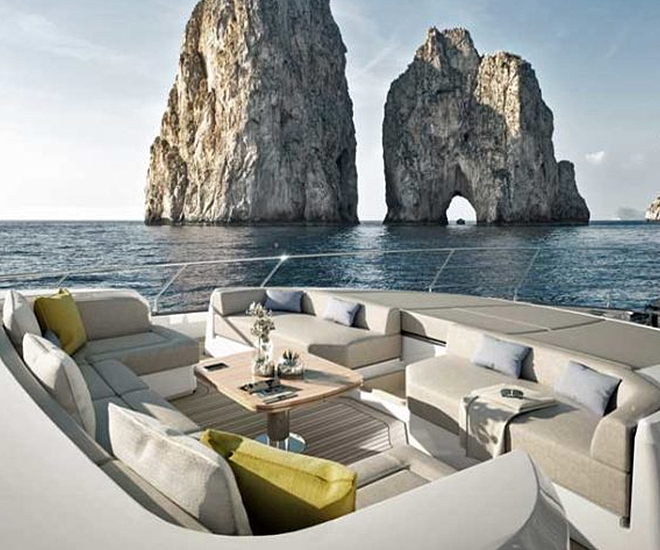 This entry was posted in Design and tagged camera, Harrods on August 9, 2013 by AFPRelaxnews.